For the past month I’ve been covering the early comics career of multimedia superstar Jubilee of the X-Men. Things were going pretty good, and then X-Tinction Agenda happened. Up until that point, Jubilee had been handled by top-tier creators at the peak of their craft. Names like Claremont, Jim Lee, and Marc Silvestri. However, despite the involvement of Claremont and Lee (plus the always wonderful Louise Simonson) X-Tinction Agenda was a bit of a mess. So much of a mess, that I considered wrapping up this retrospective for good. But as I looked at my list of Jubilee appearances to see what was next, I saw a very familiar looking cover. 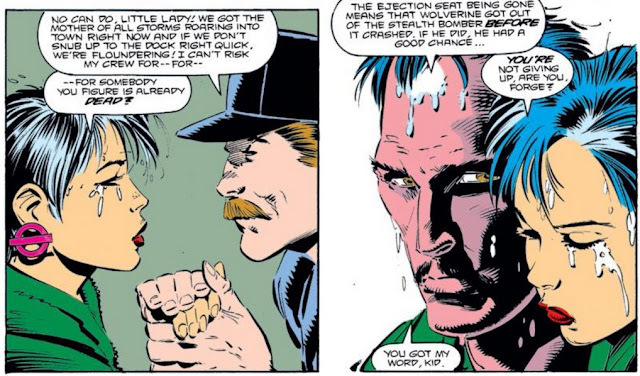 A few weeks ago, when discussing the comics boom of the early ‘90s, I mentioned a very specific Wolverine comic that stuck in the recesses of my addled mind. On the day of release, it was marked up to (I think) five dollars at my local comic shop, because it supposedly revealed that Sabretooth is Wolverine’s father. Nothing describes collecting comics in the early ‘90s quite like that sentence. 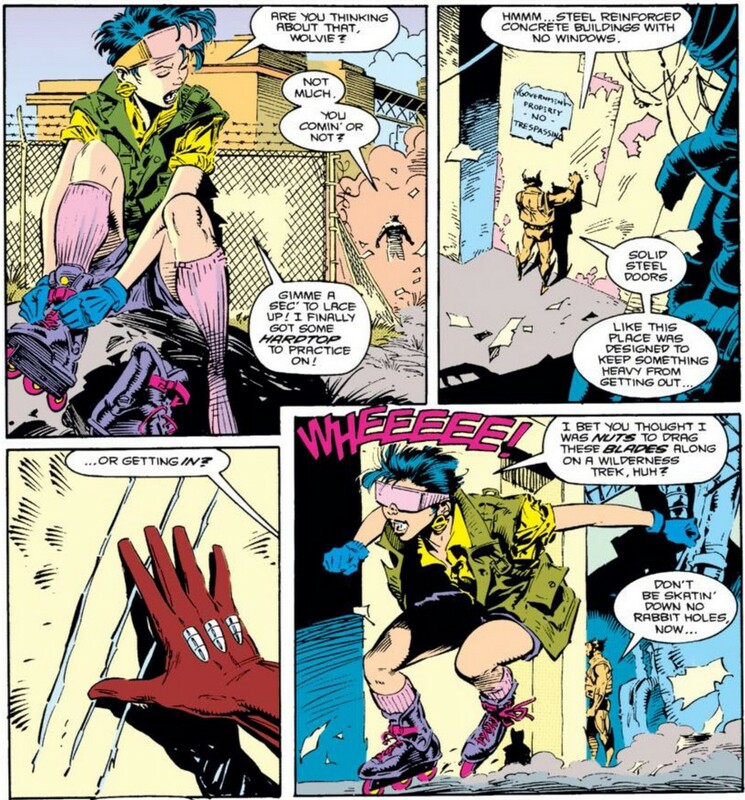 Anyway, completely unplanned for in advance, what should be the first Wolverine comic co-starring Jubilee that I have access to? That very same issue. The world is full of coincidences my friends. If only mine were more exciting. We’re getting deep into the ‘90s, friends, let’s tread carefully. Larry Hama is one of the pantheon creators for us here at the Cube, a rarefied air that includes Walt Simonson, Warren Ellis, and Frank Miller. At least Travis and I think so. Duy isn’t on the Hama bandwagon with us. Hama and Silvestri is a spectacular team that almost makes me want to read more Wolverine, which is quite a feat, considering it’s Wolverine. Forge and Jubilee dive deep into the East River, searching for Wolverine, who was fighting his robot clone Albert onboard a stealth bomber when it crashed into the water. They find Albert, out of commission, but Wolverine is missing. 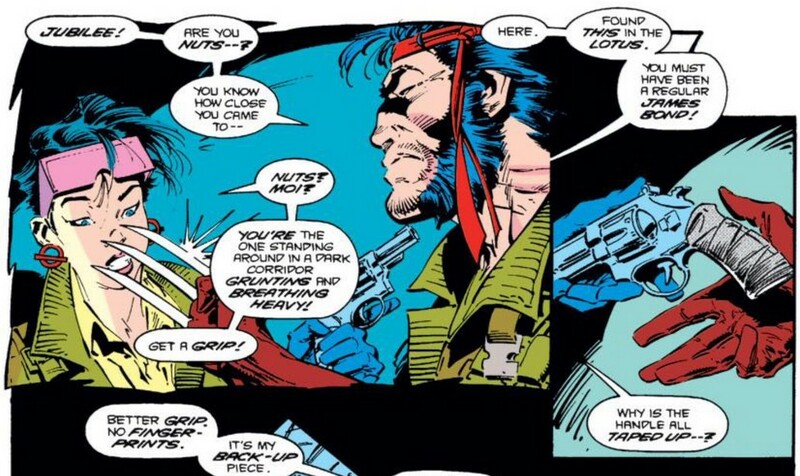 Jubilee and Forge return to the boat topside, and Forge reassures her that Wolverine made it out alive. Elsie-Dee drags an unconscious Wolverine to a nearby sewer, then runs off to get help. Forge and Jubilee are still on the search for Wolverine, with Forge calling in some favors. Wolverine finds Sabretooth, and that’s when Sabretooth drops the bombshell. He claims to be Wolverine’s father. They fight. 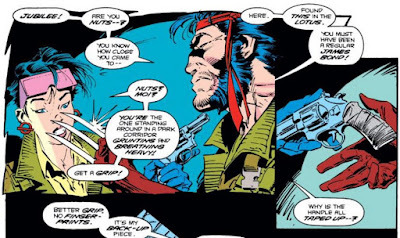 Elsie-Dee runs into Cable, because this was a ‘90s mutant book after all. Forge and Jubilee promise to keep looking for Wolverine despite their lack of success, while Albert isn’t as out of commission as he looked. I don’t have access to the next issue of Wolverine; it’s not on the Marvel Unlimited app, and there’s no way I’m going to pay for it. Sorry, Jubilee is important to me, but not that important. To my knowledge, the Sabretooth reveal was debunked by Nick Fury in the very next issue, resolving that speculation once and for all. Later validated by the Origin mini-series. By the way, if you have a tablet, I highly recommend you pay for a subscription to the Marvel Digital Comics Unlimited app. This storyline was billed as a sequel to Weapon X. The more they search the facilities, the more Wolverine starts experiencing visions of his past. Jubilee, of course, gets a little too close, during the tense moments, almost getting herself cut. Wolverine’s past was kinda like The X-Files, too complicated for its own good. By the time they finally resolved it, nobody cared anymore. Still, if there is any Wolverine I was going to read, it would be Hama’s. Wolverine is on the trail of the Professor, and is returning to a familiar facility in Canada. 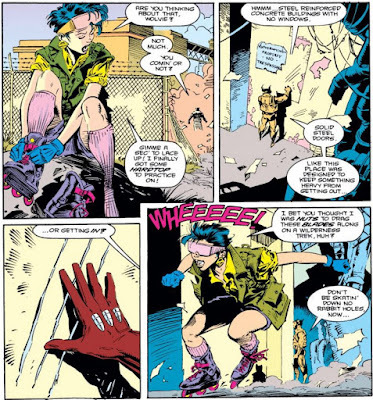 Jubilee wants to go with him inside, but Wolverine insists that he go alone. 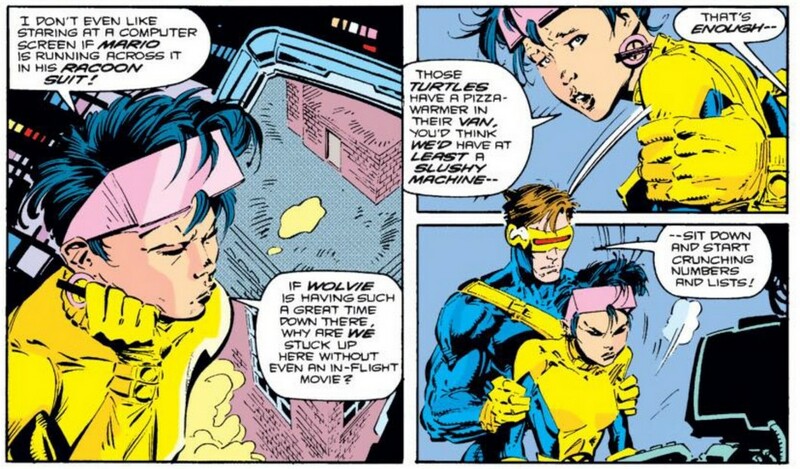 While Wolverine explores, Jubilee is bored onboard the Blackbird. Professor X and the rest are sifting through the data of a very large file on Wolverine he had procured from the NSA. Jubilee makes a reference to Super Mario Bros 3 and the Teenage Mutant Ninja Turtles in back-to-back panels. If she had been real, she would have been the perfect girl. We would have roughly been the same age, so it’s okay for me to say that. If I had been like those weirdos that thought of Kitty Pryde as their girlfriend, I would have been in love with Jubilee. But I wasn’t. If anything, I had my sights on Psylocke or Mary Jane. I’ve said too much. 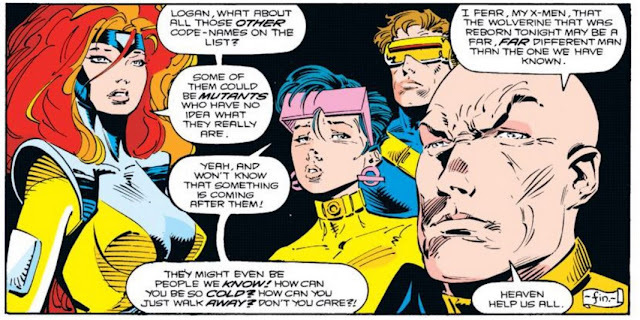 In the NSA files, the X-Men discover Wolverine’s name at the top of a mysterious list (Shiva’s hit list). The Professor is visited by a gun-toting individual in a hood, that turns out to be Silver Fox, who is surprisingly not dead. 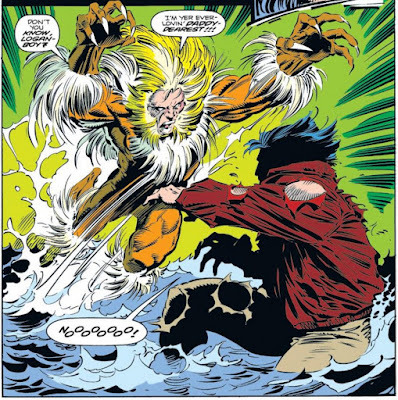 As they fight, Shiva hits Wolverine with electronic pulses that trigger cybernetic implants, which cause Wolverine’s most traumatic suppressed memories to all come roaring back. 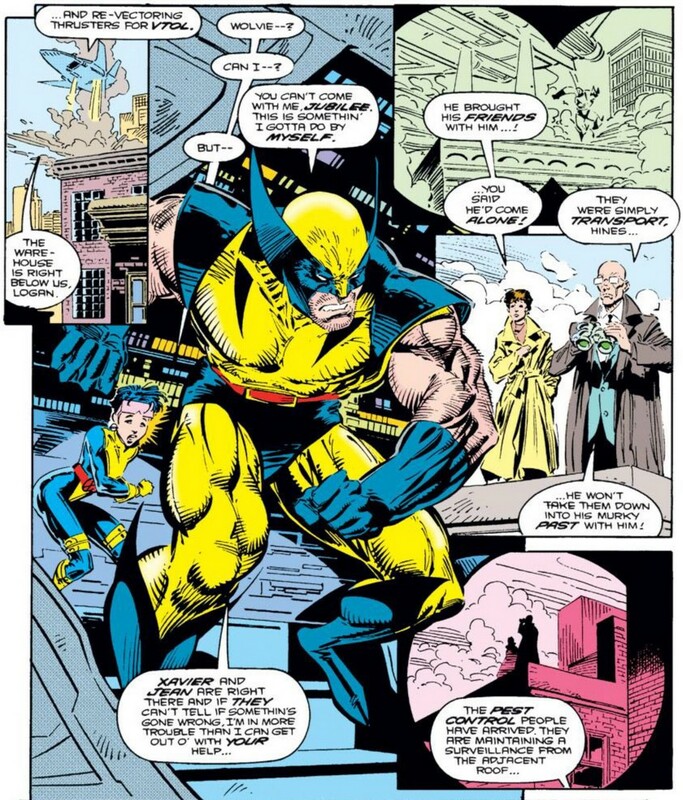 Silver Fox watches Wolverine’s “memories” on the monitor along with the Professor, but doesn’t believe they really happened the way they’re shown, suggesting that the implants might not be altogether true. Barely any of this involves Jubilee. Wolverine defeats Shiva, because that’s what he does (and his name is on the cover). 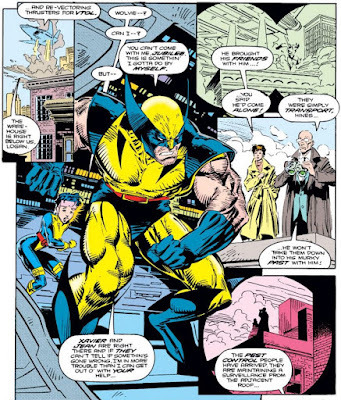 Wolverine runs to the control room, accompanied by the X-Men, who had rushed in after discovering that the list was part of Project X termination parameters. Silver Fox is gone, but the Professor lies dead (not to be confused with Xavier). His hook hand resting on the activation controls for the remaining Shiva overrides. Only this time, they’re after the next name on the list, Sabretooth. Wolverine isn’t too concerned about that, but the X-Men are concerned. They’re concerned about the next names on the list, the names that might not deserve what’s coming for them. Professor X warns them that the Wolverine that was reborn that night, might not be anything like the Wolverine they’ve come to know. However, Jubilee would get to star in a few mini-series from time to time. We pick up with those, next week!